R. Jorgensen Antiques of Wells, Maine specializes in fine period American Antiques, English Antiques, and French Antiques from the 17th, 18th, and 19th centuries, as well as fine Anglo-Indian Antiques, Scandinavian, Chinese and Continental furniture and accessories. From Queen Ann to Regency, Georgian to Federal, our large inventory covers the celebrated designs of Chippendale, Hepplewhite, Adam, and Sheraton, as well as a broad range of country furniture. 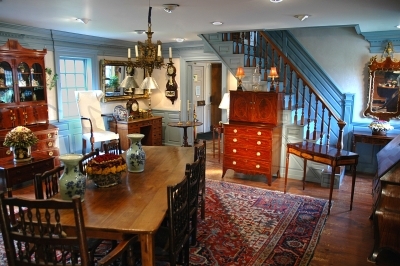 In 45+ years of searching New England, we have handled many antiques made by distinguished American craftsmen such as McIntire, Willard, and Seymour of Massachusetts, Dunlap of New Hampshire, Goddard and Townsend of Rhode Island, Chapin of Connecticut, Quervelle of Pennsylvania, Phyfe of New York, and countless others. We have also had English and Irish and Continental pieces such as Gillows. Our large collection of formal and country antiques, crafted from beautiful woods of Mahogany, Walnut, Rosewood, Pine, Oak, Cherry, Birch and Maple, is selected with an emphasis on condition, quality, and aesthetic beauty.